Martha Meacham on Navigating Copyright Issues: When Should We Be Concerned? Hi, my name is Martha Meacham. I am a librarian at the Lamar Soutter Library, University of Massachusetts Medical School. We are always happy to help answer the many questions we receive about copyright. While this can be a complicated issue, it shouldn’t be scary. A little background understanding and due diligence will help guide you while navigating copyright. Copyright is a set of exclusive legal rights granted to the creators of works that allows them to control the copying, reuse, redistribution, creation of derivatives, and performance of their works. While copyright allows creators to benefit from their works, particularly financially, it also has some important limitations that benefit the public. Just because something is copyrighted doesn’t mean it can’t be used; the proper steps just need to be taken. Hot Tips: It can be a challenge to determine if copyright needs to be taken into consideration. 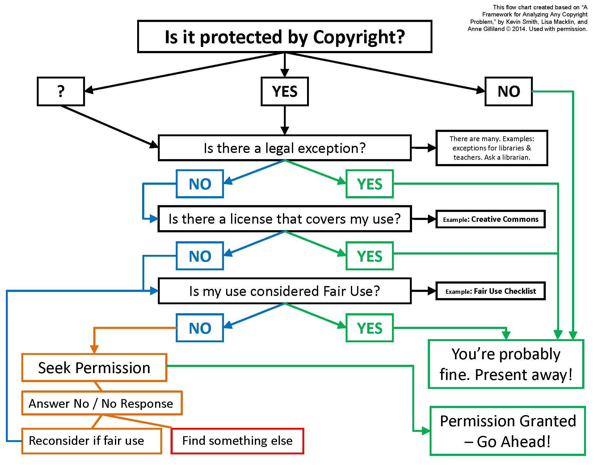 The Copyright Flow Chart below can help guide you through some questions to ask when considering if copyright is applicable. Lessons Learned: You may need to do further investigation in areas like Creative Commons Licenses or fair use. Remember, you can always ask for permission. However, don’t wait until the last minute to start thinking about copyright. Finding answers and seeking permissions can take time. Avoid the temptation to ignore the issue, or use something questionable because time has run out to take the proper steps. Rad Resources: There are many great ways to find materials where copyright is not an issue or has been explicitly addressed. Anything produced for or by the government exists in the public domain (something belonging or being available to the public as a whole, and therefore not subject to copyright). For example, the NIH Photo Galleries, the CDC Public Health Image Library, and a database of U.S. Government Photos, all provide materials that exist in the public domain. Other resources contain images that have Creative Commons Licenses. Sites like Flickr allow you to search by Usage (specific Licenses) or restrict to just Creative Commons Galleries. Additionally, almost all images found in WikiCommons have some sort of license that allows for their use. Regardless of resource, it is wise to double check the specific license for a specific image, and always give credit to the source. Finally, the Lamar Soutter Library offers some great resources about copyright here. Also check out the Columbia University Libraries’ Copyright Advisory Office and Fair Use checklist and the Copyright and Fair Use page from Stanford University. When in doubt ask for help. Copyright can be tricky but there are many guides. With a little practice, your copyright journey can be smooth sailing.